Erinn and Sam's Spring East Hampton wedding was an affair to remember. I had one of the best times capturing the memories of their day and to be quite honest, I didn't want to leave. I loved photographing their laughs, their pristine sense of style, but most importantly their love and the love their families and friends, had for them, on that day. The wedding perfected the style of a wedding magazine worthy event-from the dresses, to the tuxedos, to the venue and all the details throughout. Erinn and Sam made sure to have every bit of sweet romanticism showcased splashed with eccentricity in both their ceremony and reception. I adored the venue they chose-it encompassed what I feel a Hampton wedding should be: classic, laid back, whimsical, artistic and voguish. The Hedges Inn encased Erinn and Sam's vision of rustic, unconventionalism across its grounds to execute their inventiveness beautifully. Even the wedding cake had individuality and flare showcased-funfetti naked cake, anyone? I truly had a lovely experience being a fixture in Erinn and Sam's wedding day. Every wedding I photograph has its own unique artistry that shows beautifully within the photos and Erinn and Sam's were no exception. I love when a couple presents their singularity within the design and tone of their wedding; it makes you understand and feel the sincerity of their union and their love for fun. For anyone that lives in New Jersey, "The Shore" is 141 miles long beginning in Perth Amboy and ending at Cape May Point (or beginning at Cape May Point and ending in Perth Amboy-depending on how you look at it. It's the least uncommon to come across a beach wedding here in our state. But, with something uncommon, comes something spectacularly unique in each couple that says "I do" in front of an ocean scape. 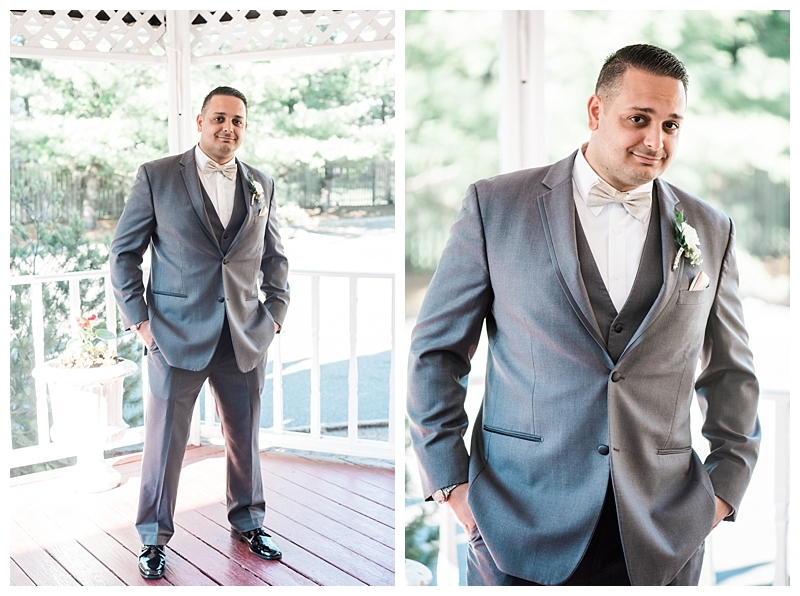 Alyssa and Gustavo were married on a beautiful October day, underneath a gazebo in Beach Haven, New Jersey. Both families merged as one as everyone sat among one another with the sweet salt air gently blowing through. Alyssa and Gustavo are the sweetest of couples with friends and family beautifully matching both of their lovely personalities. The wedding scheme and style was all things that encompassed beach wedding, Autumn wedding. 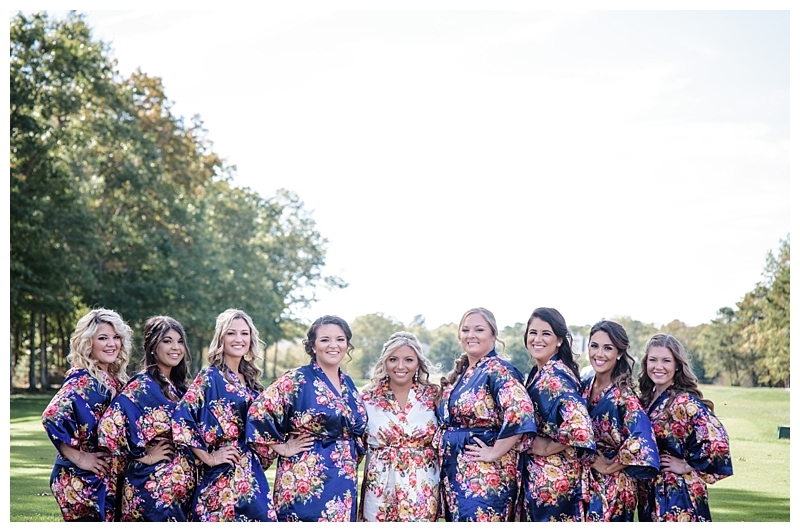 With romantic shades of blue and hints of deep oranges and pinks; each color enveloped the bridal party and soon-to-be husband and wife perfectly. 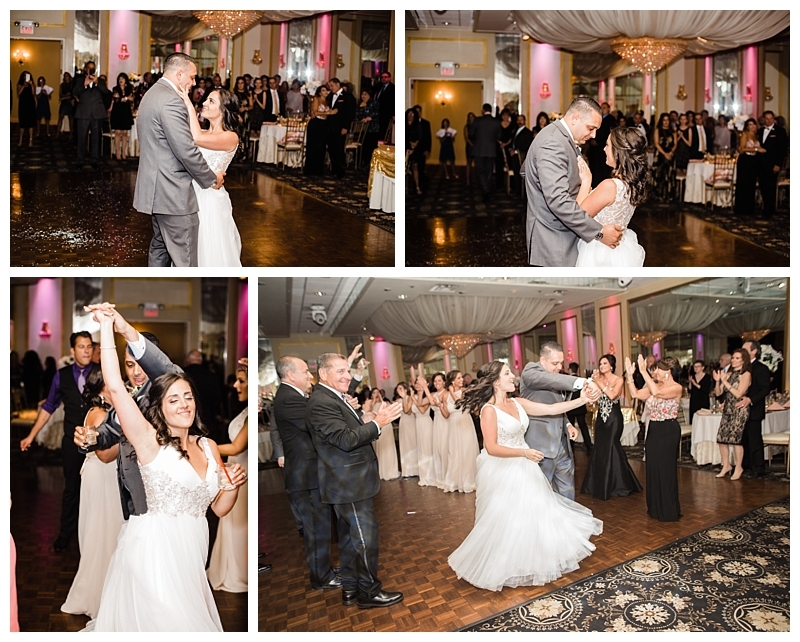 The reception was held at Antoinetta's Restaurant where everyone dined and danced, laughed and embraced, celebrated and made new memories. I absolutely loved photographing everyone and watching two families join together-it's a most beautiful feeling. A feeling that I have the honor of experiencing with every wedding I photograph. I loved the attention to detail especially with their wedding cake and the cake topper that said "Fall in Love". So sweet! I will never get tired of capturing weddings along "The Shore"-it's a piece of my life that will always be apart of me. Born and raised along a strip of an island with the sounds of seagulls, the smell of salt water and the feeling of sand between my toes will forever keep me in love. Now, just add an insanely happy and in love couple to that mix and I literally have the best job ever. I couldn't have been happier that Alyssa and Gustavo chose me as their wedding photographer. They are truly a special couple that adores one another in such a way, you can't help but feel light and elated to be around them. What can I say about Angelli and Chris that I haven't said already? In February of 2017, I had one of the best shooting days while capturing the newly engaged couple, at Longwood Gardens (Read about their shoot, here!) and on a beautiful day in October, I had the honor of capturing their wedding day. All three of us have become extremely close, so forgive me for being a bit bias, but their weddings had to be one of my favorites. 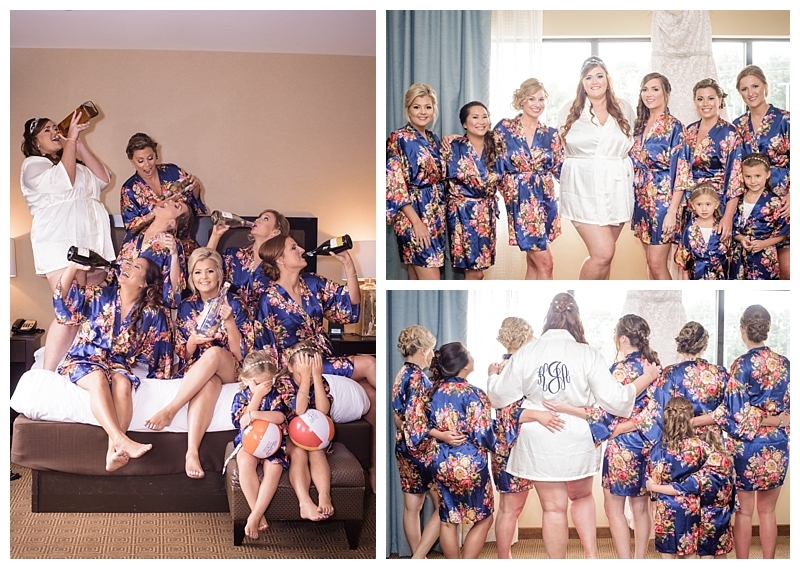 From beginning to end, it was lighthearted and fun and elegant. Everything Angelli and Chris are. 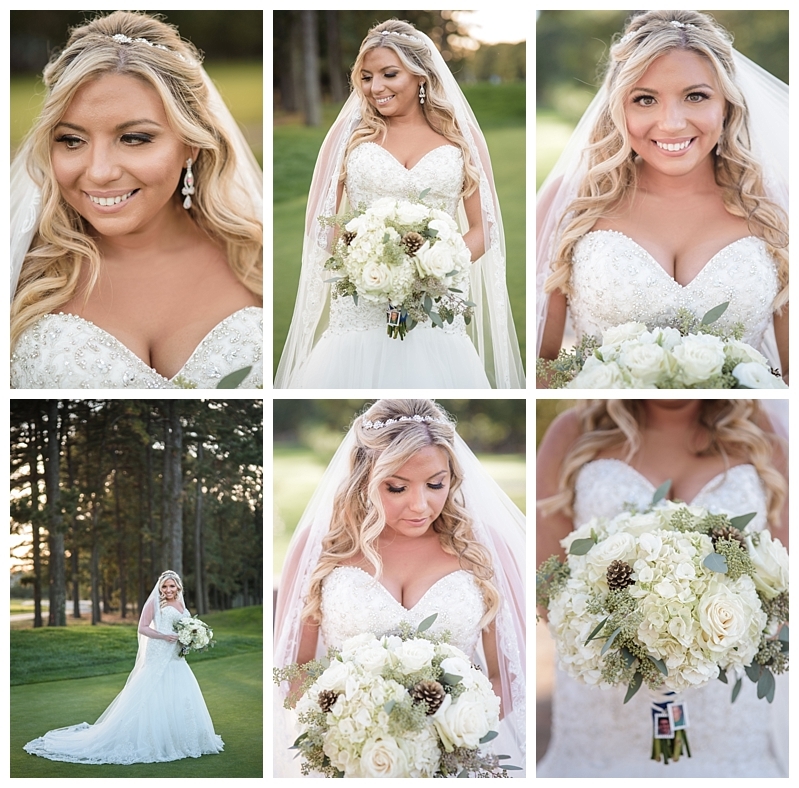 Their ceremony and reception were held at the Blue Heron Pines Golf Club in Galloway, NJ and every bit of detail that a wedding could have, was showcased to perfection. Between Angelli and her bridesmaids and Chris with his groomsmen; everyone looked their absolute best and their energy beamed throughout the entire day. The one thing that kept standing out to me, was the sunset. I know, I know-you're probably thinking "Out of the ENTIRE wedding day, why the sunset? ", but it played a significant role in Angelli and Chris' day. Their wedding was warm, inviting, loving and pure-it was the same feelings that were brought to my attention while I photographed them during the later part of the afternoon. I kept saying to myself 'How perfect is this?" and it was. Angelli and Chris' reception was a beautifully curated rustic theme with drops of classic romanticism throughout. I absolutely adored their cake (links to venue and vendors, below! ), I love traditional wedding cakes, but their cake was unique and had so much character, it was hard NOT to compliment it. The evening was filled with laughs and happy tears, dancing and great food. It truly was a day that needed nothing more and I was so elated for them and their family and friends. Angelli and Chris are a timeless couple, I guess even "#relationshipgoals"? Their deep love and respect for one another makes me know for certain, that their love, is a love that will last. Through good times and in bad, for as long as they both shall live. If you want to talk about stylish, simplistic, romantic weddings-let's talk about Stephanie and Chris' wedding. Absolutely breathtaking. Their day started with themselves and their parties getting ready in two of the most beautiful, modern designed homes in Asbury Park, New Jersey. Asbury Park has amazing homes throughout the town, but the two that Stephanie and Chris had selected were so incredibly dreamy. Definitely a photographer's dream. So much warm, natural light and tied perfectly into getting married in Asbury Park, as well. Stephanie's dress was out of this world. It was the perfect cut for her-a low back, semi-mermaid styled dress that laid on her beautifully and gave off this summer, beach wedding energy that was wispy and whimsical. 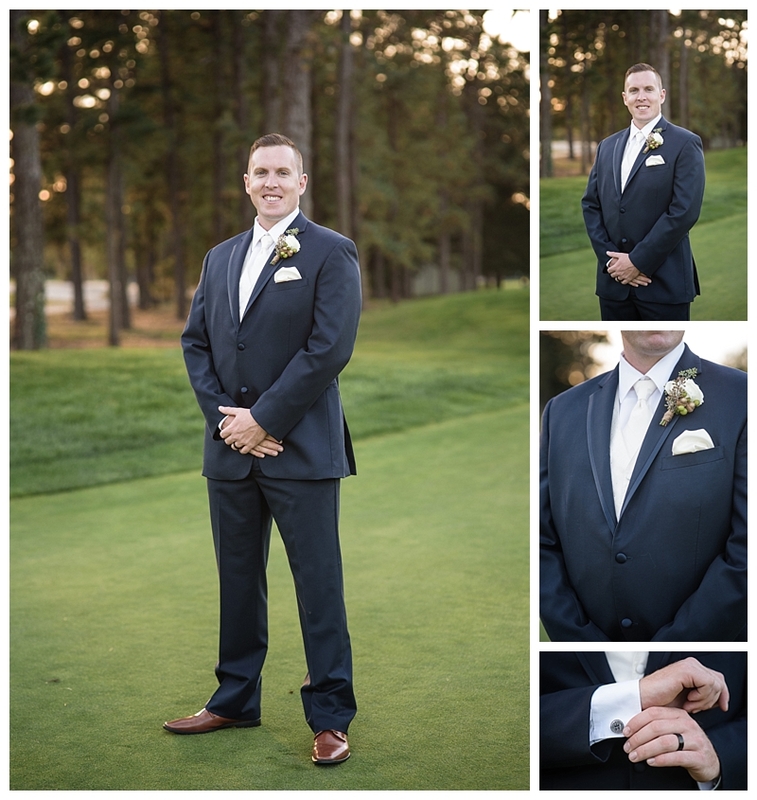 Chris and his groomsmen looked handsome in their tan suits with fresh Adidas that was gifted to all of them, by Chris. I thought that was a nice gesture and definitely added to the already awesome style of the guys. Out of all of the beautiful, perfect parts of their wedding-what I loved most was the personable touch of their wedding bands (and engagement ring!). Stephanie's very dear friend, Lauren Priori, owns a private jewelry business in Philadelphia named: L. Priori. 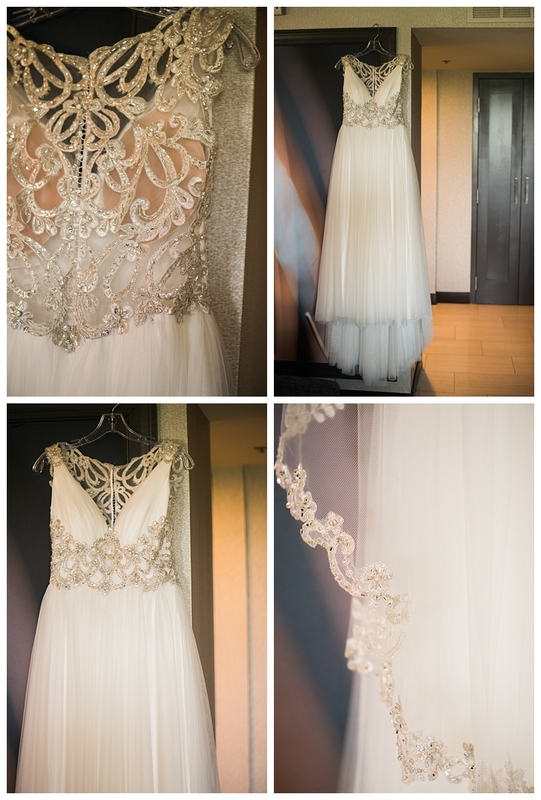 Each piece was custom made for both Stephanie and Chris and I adored that added touch. Lauren's jewelry collections are mind blowing and you should have a look whenever you can-classic romanticism at it's finest. As Chris and Stephanie said "I do", I will never forget photographing them and taking notice to how perfect the sky was. It was this soft pinkish-purple color and it was exactly the sky you would want on your wedding day-I don't stop snapping photos of the two of them-it all looked so breathtaking. Stephanie and Chris had their reception at Tim McLoone's Supper Club on Ocean Avenue in Asbury Park. 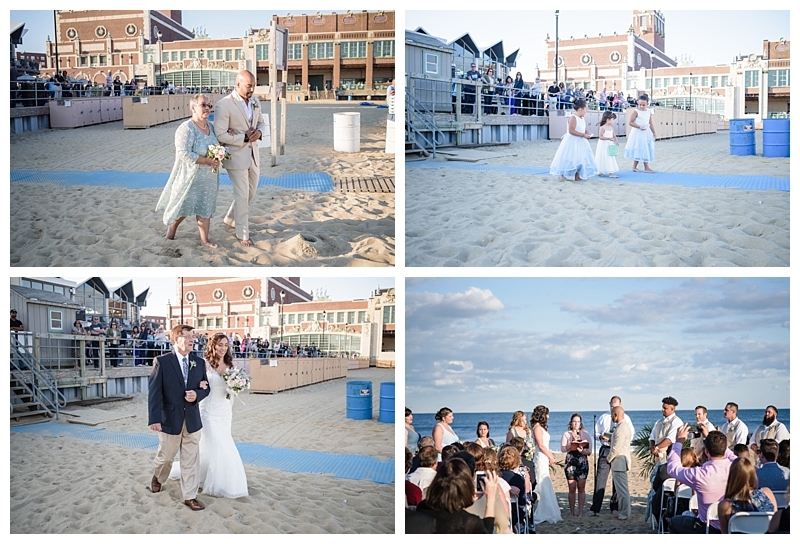 It has amazing oceanfront views throughout the place accompanied by a 1940's feel to the decor and general tone-perfect for Stephanie and Chris' wedding reception. Toward the end of the night, they had fireworks and everyone got to watch them together and enjoy them. It was truly a magical day and night for Stephanie, Chris and all of their friends and family. On a cold day in January of 2017, I had the pleasure of photographing Scott and Kristin's engagement shoot, so it say that I was excited to photograph their wedding 7 months later, is a total understatement. 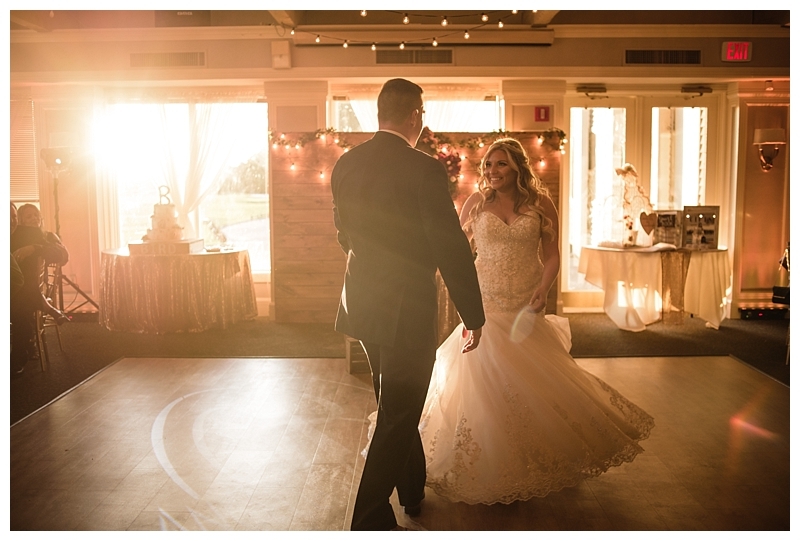 Scott and Kristin were married at the Sterling Ballroom in Tinton Falls, New Jersey in front a wonderful group of friends and family. I love working with the Sterling Ballroom because they really know how to host and organize a gorgeous wedding- they also work well with wedding photographer and other vendors-very accommodating. Kristin and Scott's wedding was your beautifully themed romantic day-every detail and piece was romantic and vintage in nature-clean style and simple tones. Everyone looked stunning and dapper. Kristin and Scott are another one of my favorite couples because of their sense of humor and how well they compliment each other. Plain and simple, they are by far the cutest of couples. And their friends and family are just as amazing--funny, great senses of humor, loving. I love, love, love when a couple makes the decision to do "first looks"-it's a chance for the soon-to-be husband and wife to have a private moment with no distractions. They get to take a moment to look at each other, take it all in, sneak a kiss, shed a tear, say something meaningful and funny. So when Kristin and Scott had their first look, the intimacy of the moment is what makes my job so worth it. Kristin and Scott's reception was lovely. The lighting was beautiful, their floral arrangements and place settings weren't overwhelming, which I like. 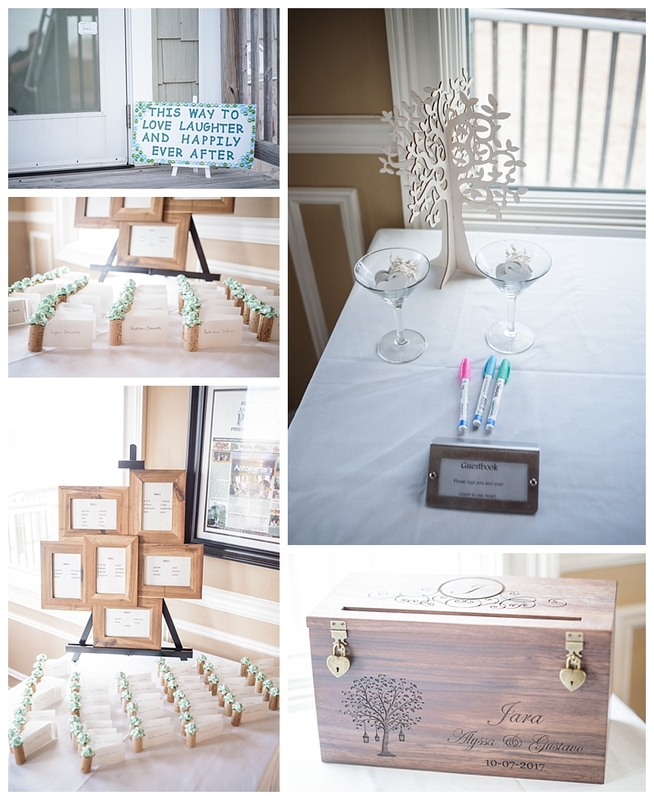 It's nice to be able to appreciate the wedding details throughout the reception when there isn't too much going on. It's always best to select your favorite wedding inspirations and make it your own-and that's exactly what Kristin and Scott did. It was definitely a magical day for both Scott and Kristin, their family and their friends and I couldn't be happier to be a part of it. Amanda and Brian were married on an incredibly rainy day, in July. And when I say rain, I mean, the most rainfall I've seen in a very, very long time. Amanda took it in stride, though. I have to hand it to her. It's completely understandable for a bride to become very stressed when there's inclement weather on her wedding day, but not Amanda. If she was freaking out, you would never know! She held out as long as she could until she made the decision to take her outdoor ceremony indoors. Amanda and Brian's wedding was so cute! It had this complete retro feel to it, with little pieces of modernism peeking through here and there. I definitely felt like I was attending a wedding from the late 1950's-early 1960's. From the wedding dress, to the color choices to the attention to detail; retro was definitely it and Amanda, the "it girl". Her and Brian, a hockey player, are incredibly sweet together and it showed throughout their day. So much adoration and trust. They say, that rain on your wedding day, is the best of luck. And if you were there to witness the amount of rain that poured on Amanda and Brian's day, you would say that they will have the luckiest marriage on earth. Natasha and Matthew's wedding was the peak of romantic vintage glam. They found me because I shot Matthew's brother, Anthony, and his wife Heather's wedding at The Crystal Ballroom! I love to photograph weddings of siblings because I have the opportunity to catch up and see how everyone's doing. Natasha and Matthew had a beautifully detailed wedding-from the ceremony to the reception, it was a magical day. I adored Natasha's wedding dress, it actually made my eyes pop out of my head. It was the perfect amount of romantic glam with the most attention to detail. It flowed beautifully, it fell perfectly and it was one of those wedding dresses that you see that you think "Wow, it was if it was specifically made for her." 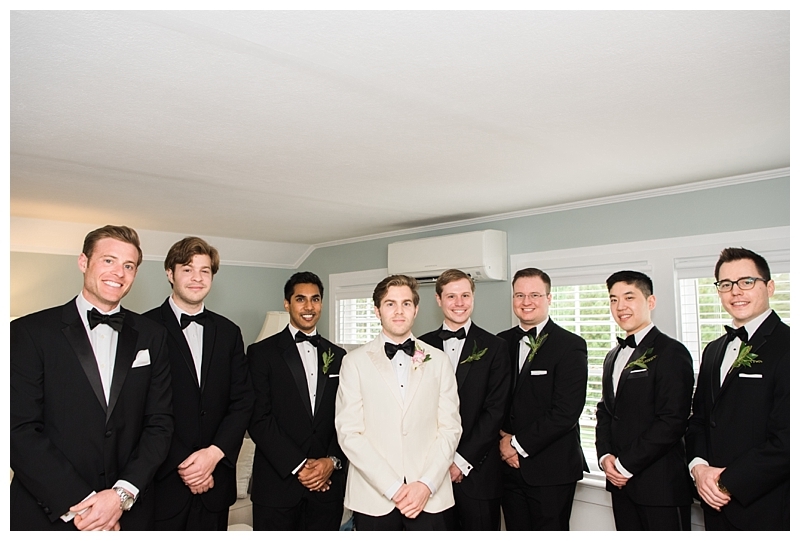 The groom and groomsmen donned a light gray suit with champagne ties and pocket squares that complimented the bridesmaid's dresses perfectly. Natasha and Matthew had a beautiful outdoor "first look" and ceremony that transitioned to a full on party during the reception. Every single person had the time of their lives and I loved being there to see it! It's always a day of celebration and when you feel the love, not only from the newly married couple, but all of their friends and family; it adds to the already special day. The way Natasha and Matthew set up their wedding reception was just as romantic and glamorous as their dress and suit. From the lighting to the table settings and all of the little extras-it was stunning and no detail was overlooked. You can tell that they were really proud with how everything turned out--styled to the max! I loved photographing their day and Matthew's brother's day and I hope I get the chance to capture more family moments in the future.